Wonderful photos, it shows a very beautiful city. Not sure what the numbers mean but I'll be back to find out the answer. 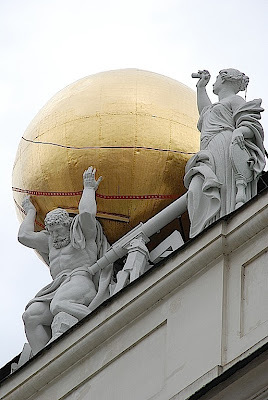 What an evening of contrasts, poor old Atlas still struggling to hold up the world, candelabra through a windoe and hot dogs in all your finery befor the opera. I love your touches of gold in the photos lie a musical theme running through the post. What a golden city, bathed in golden light! 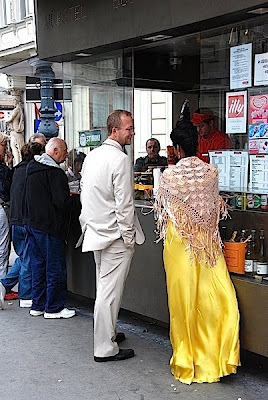 I want to be the lady having a hot dog before the opera! 1457 -- how many posts you've done? 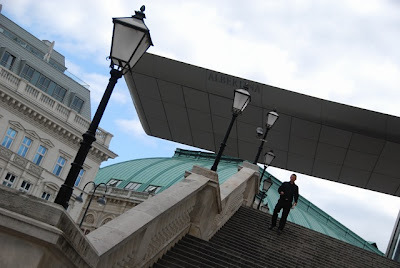 Exquisite photos of the architecture and the opera goers. Those are very yellow trousers! I love the peek into the window. And the off kilter fifth photo. A hot dog before the opera...a sign of the economic times? Were the man and woman a couple? I couldn't help but wonder. 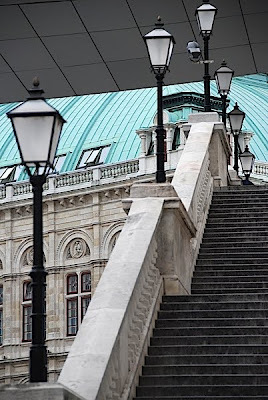 Those parapet figures grace the National Library at Josefsplatz, only a few steps from Albertinaplatz, where the hot dog stand is located, between the Albertina Museum (the stairs lead up to the Albertina Palais) and the Opera, the building with the verdigris roof. 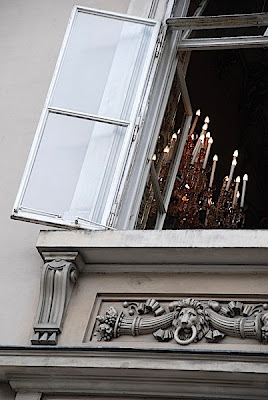 Opposite the Josefsplatz building of the National Library stands the 225 years old Palais Pallavicini, where I photographed the window with the chandelier. 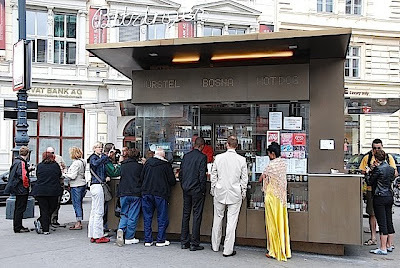 Viennese have a love affair with their hot dog stands, Würstlstand. They call their Wieners "Frankfurter", btw - very tongue in cheek, aren't they? 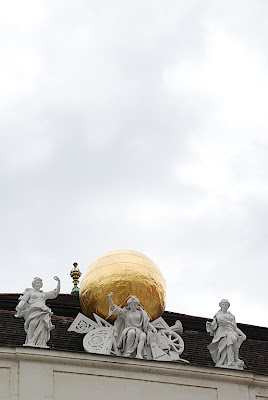 Gold and verdigris - a city with patina - and blue skies, these are the colors I think of when I think of Vienna! Three and a half years, and counting. I would have never come this far without the support of all of you! And I would like to take this opportunity to thank you all for understanding that I cannot possibly put out a daily blog and always answer your kind comments. I appreciate them immensely, they often keep me going, when the demands of life threaten to steal that little time I try to find daily to endulge myself in this little silliness of mine. THANK YOU! When she walked, it looked like a beautiful gown! I have heard music playing at time, when I walked by Palais Pallavicini, I have also seen festively dressed people in those windows, as if they were attending a grand ball. Hot dog before the opera is not necessarily a sign of the economic times. 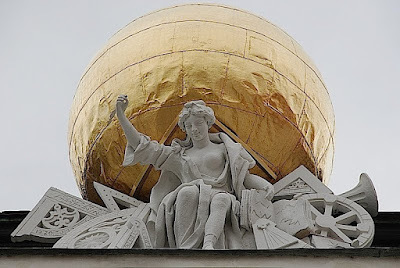 I would say it is a sign of a certain Viennese nonchalance. Wow! That yellow dress with the shawl is stunning. What a great image she makes!